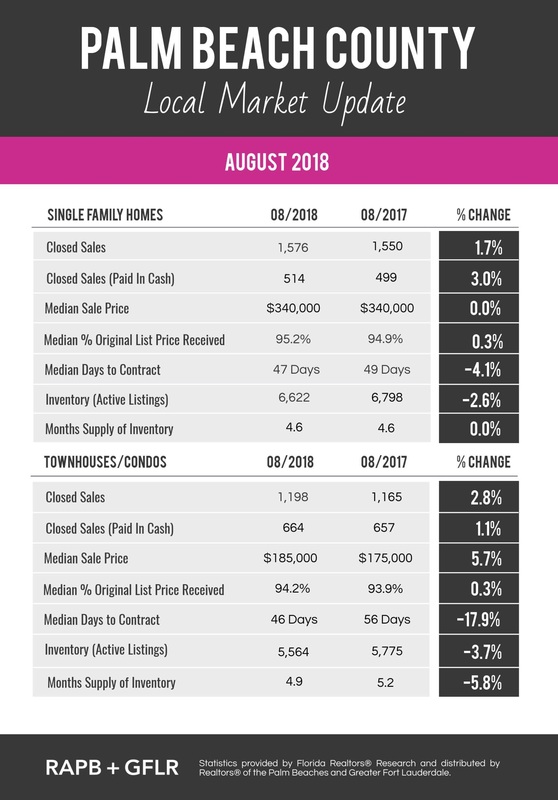 The lack of significant sales growth in Palm Beach County in August 2018 compared to August 2017 is likely due in part to the continued decline in the number of active real estate listings, aka inventory. The inventory of homes for sale (active listings) in Palm Beach County has declined 2.5% for single-family homes compared to the inventory of homes for sale in August 2017. The decline in active condo/townhome listings in Palm Beach County has shown a slightly more significant decline of 3.7%. Not only does this continued decline in inventory limit the potential to see any substantial sales growth, but also serves to reinforce the conditions of a “seller’s market” which we are continuing to experience in Palm Beach County, FL. If you would like to learn more about the current South Florida real estate market or the market conditions in Boca Raton and other areas within Palm Beach County, FL, please contact the local market experts at Champagne & Parisi Real Estate at 561-998-9015 today!